The mother of a woman who was killed in a crash with a duck boat in Boston Saturday is questioning what could have been done to prevent the tragedy. Martha Warmuth went outside Thursday morning and saw a lemon tree. She couldn't help but think of her daughter, Allison. "She didn't take the lemons from life,' she said. "The hard things, the bitter things, and let them beat her. She would turn them into something good." It's difficult for Warmuth - who spoke to necn over the phone - to find much good right now. Allison, 28, was killed this past weekend after the scooter she was riding collided with a Boston Duck tours vehicle on Beacon Hill. "She was a good driver," Warmuth said. "I know Boston streets can be scary, but she was a good driver." Warmuth says she understands the duck boats are part of the fabric of Boston, but she thinks the city has been irresponsible in the way the hulking amphibious vehicles are regulated. "It's ridiculous, honestly, that the city of Boston would allow a military truck with huge blind spots out on their streets," she said. She thinks the city should limit where the duck boats can travel and require that two employees run the tour - one to point out city landmarks, the other to focus on driving and potential hazards. "That should never be," she said. "They should have their eyes 100 percent on the road." No charges have been filed from Saturday's accident. Boston Police are still investigating. 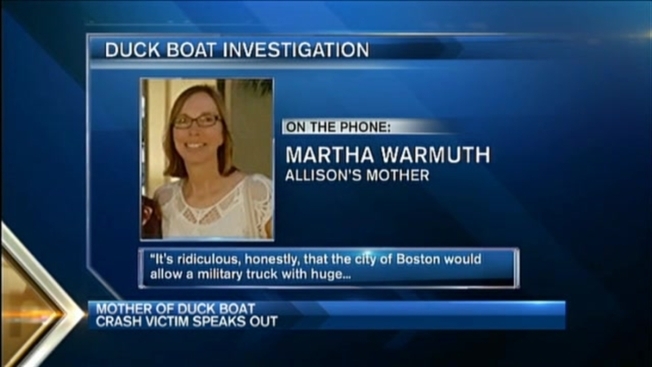 Warmuth says she's disappointed to learn of the duck boat operator's driving history. VOTE: Should Duck Boats Be Banned in Boston? Though none of the incidents appear to have happened on the job and he has not been charged in this accident, 41-year-old Victor Tavares has had several speeding tickets, license suspensions for non-payment of citation, and other safety violations over the last 20 years. "I really wish that that hadn't been true," Warmuth said. As for the passenger on Allison Warmuth's scooter, her mom said her daughter and the 34-year-old man were just friends. She says she's spoken to him, but wants to maintain his privacy. "This has turned a lot of people's world upside down," she said. Funeral services for Allison Warmuth will be held in Lexington, Massachusetts, on May 14.